The quote in the image above comes from his essay The Ascendance of Eroticism. 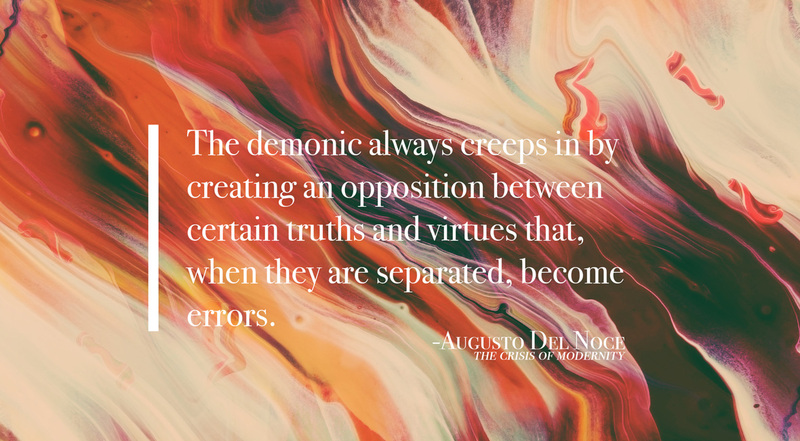 “The demonic always creeps in by creating an opposition between certain truths and virtues that, when they are separated, become errors.” In other words, we cannot separate truth and love. Many Christians proclaim, almost with exasperation, that “we just need to love people.” Of course, this is absolutely true. But it is the devil’s lie that we can love people and at the same time withhold or obscure the truth from them. To love is to reveal the truth for the good of the beloved. The apostle John tells us, in his first epistle, that God is love. In his Gospel he records one of Jesus’ most famous lines: “I am…the truth.” God is love. God is the truth. What God has brought together let no man separate. Love and truth exist eternally within the being of the Trinity. When God loves, he loves in truth. When God speaks, he speaks only the truth from a heart full of love. To love is to reveal the truth for the good of the beloved. We cannot love without speaking the truth; we cannot speak the truth unless we love. To separate truth and love is to commit an act of demonic violence against the created order. This is what Del Noce means when he says the demonic creeps in when an opposition is created between truths and virtues. We don’t see it coming because our intentions are pure. However, the separation of truth and love is always an act of hell because the devil’s aim is to pervert believers into people who are either too committed to the truth to love others, or so insistent on loving others that they won’t defend the truth. Of course, both versions are walking contradictions. One cannot be a disciple of Jesus Christ and divide the very essence of God’s being. God is love. God is the truth. God loves us. God tells us the truth. And his command to us is to speak the truth in love. The devil seeks to divide truth from virtue in our minds, thereby pitting God against himself in our imaginations. If we live with the idea of God at war with himself, we will fail to be faithful disciples of Jesus Christ. We will fail, in other words, to both love and tell the truth. Your review makes me eager to read this book! How prescient this is!